Location: 662 – 2nd Avenue, Fernie, B.C. Details: Clawhammer Press was born of a winding journey through the mountainous terrain of small town graphic design. After working full-time as a graphic artist in Cranbrook, BC for a few years. Owner-operator Michael Hepher decided to get back to his roots. With some experience in historic trades as a blacksmith, Michael was keen to learn the origins of graphic arts by finding out how to hand-set type. A well-placed question with the local printer landed a large press and a palette of gear in his garage. 8 years later hand-set type and letterpress printing has become a larger part of his life than even he thought possible. In the spring of 2011, Michael and wife Anie, with 2 kids and 1 dog in tow, loaded up and moved to Fernie, BC. to pursue some more creative opportunities there. 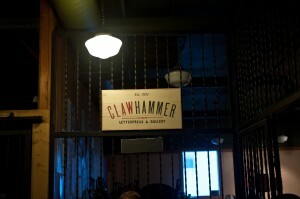 Before long, a suitable space presented itself, and in August 2011 a lease was signed, and Clawhammer Press was born. Michael has a passion for art in many forms, focusing now on letterpress printing and painting. The Clawhammer Letterpress & Gallery features a working letterpress studio, retail ephemera, and fine art gallery featuring local and Canadian artists. The name Clawhammer originates from the old-timey style of plucking a banjo that conjures porches and straw hats in the heart of Appalachia. Moreover, it conjures images of bygone eras, of dark wood and cast iron, and mimics the sound that the old presses make turning over. It’s also a metaphor for the journey of the small-town artist scratching and fighting their way to their dreams of making art full-time. Performers or Artists wishing to use the venue: Contact the owner/manager Michael Hepher at the above phone number or email address.